It doesn’t feel like 2000 was all that long ago, does it? But on the Internet, a decade is a long time. Ten years ago we were in the era of the dot-com boom (and bust), the Web was strictly 1.0, and Google was just a baby. Since then people have welled onto the Internet. You don’t actually realize how many more people are on the Internet now until you start comparing numbers. This article is an in-depth study of how the number of Internet users has grown in the past decade. We’ll start with the whole world, then world regions, then break it down even further into countries. As you’ll see, a lot has happened. First off, the one thing you probably wanted to know right away. Here is how much the Internet has grown since the year 2000. There were only 361 million Internet users in 2000, in the entire world. For perspective, that’s barely two-thirds of the size of Facebook today. The chart really says it all. There are more than five times as many Internet users now as there were in 2000. And as has been noted elsewhere, the number of Internet users in the world is now close to passing two billion and may do so before the end of this year. The Internet hasn’t just become larger, it’s also become more spread out, more global. In 2000, the top 10 countries accounted for 73% of all Internet users. In 2010, that number has decreased to 60%. 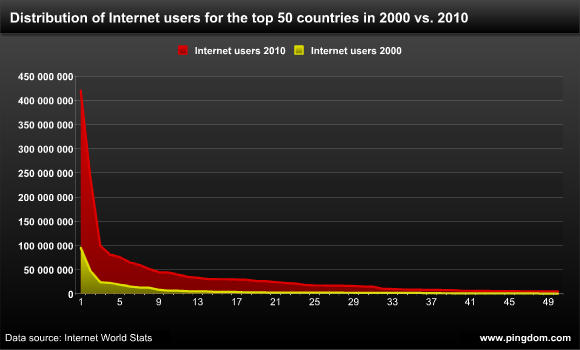 This becomes evident when viewing the distribution of Internet users for the top 50 countries in 2000 and in 2010. Note how much “thicker” the tail of the 2010 graph is. Now that we’ve established that the number of Internet users is more than five times as large as it was in 2000, how has that growth been distributed through the different regions of the world? 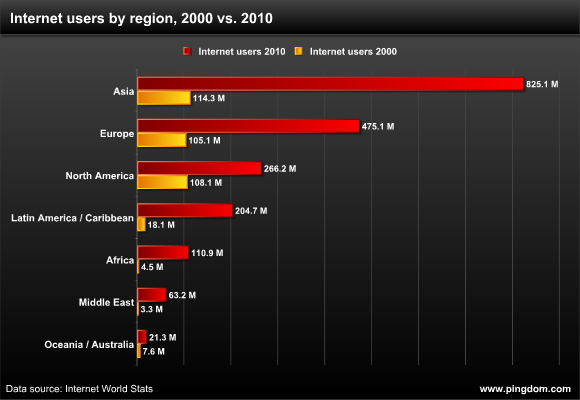 Back in 2000, Asia, North America and Europe were almost on an even footing in terms of Internet users. Now in 2010, the picture is a very different one. Asia has pulled away as the single largest region, followed by Europe, then by North America, and a significant distance exists between the three. It’s also highly notable how the number of Internet users in Africa has increased. In 2000, the entire continent of Africa had just 4.5 million Internet users. In 2010 that has grown to more than 100 million. Let’s start with what the situation looked like ten years ago. Note how the United States had more than twice as many Internet users as any other country. Comparing the top 10 in 2010 with that of 2000, the countries have been shuffled around quite a lot, with China now firmly at the top. New arrivals in the top 10 are India, Brazil, Russia and Nigeria. This of course means that some other countries have dropped out. South Korea is now at number 11, Italy at number 15, Canada at number 20, and Australia at number 27. And look closely at the numbers for Nigeria. In 2000, the country had 200,000 Internet users. Contrast that with today’s 44 million. That’s quite a boost. The United States and China are currently the only two countries with more than 100 million Internet users. China has more Internet users in 2010 than the entire Internet did in 2000. The country has actually grown with more Internet users than the entire Internet had in 2000. Since we’re looking at how things have changed between 2000 and 2010, we thought we’d include a section here showing which countries have grown the most on the Internet. There’s another interesting segment, countries that have managed to grow their numbers with tens of thousands of percent. These are countries that had a very weak Internet presence ten years ago, but have now managed to gain much wider access to the Internet. One of these countries, Nigeria, has even grown to the extent that it’s now the 10th largest country on the Internet. Although most of these countries are still relatively small on the Internet, you have to remember that some of them either don’t have huge populations, or are in less-than-ideal situations in terms of for example infrastructure. But there’s no doubt that developing countries are starting to catch up. If anyone ever thought the Internet was something of a fad, those mouths have been permanently silenced during the past decade, and these numbers show why. We also like how the Internet is becoming more widely distributed across the world. It’s no longer a club dominated by a few top countries. And you have to admit that it’s interesting looking back and realizing how relatively small the Internet was back in 2000. The 361 million Internet users from back then seem a tiny amount compared to today’s (almost) 2 billion. You know, these statistics would be a lot more useful and compelling if they were normalised for population and population growth. I don’t know whether to feel proud or weird that I’ve been an internet user since prior, even, to 2000. 2 billion makes for more than just a bandwagon, eh? Whow, Asia (China & India) is so massive, but hard to get really well-known about their online behavior.